This is Lydia's scarf. It is also a lesson in how, if I don't write things down, I won't be able to remember them. Pattern: Ripples from Knitpicks (this much I know). My soon-to-be daughter in law is tall (almost 6 feet), so I knit the scarf to be six feet long. I worked hard to finish is by Christmas, and measured it wrong - it was probably at least 7 feet long when I finished. I like the look of the pattern, and it didn't take too long to memorize. 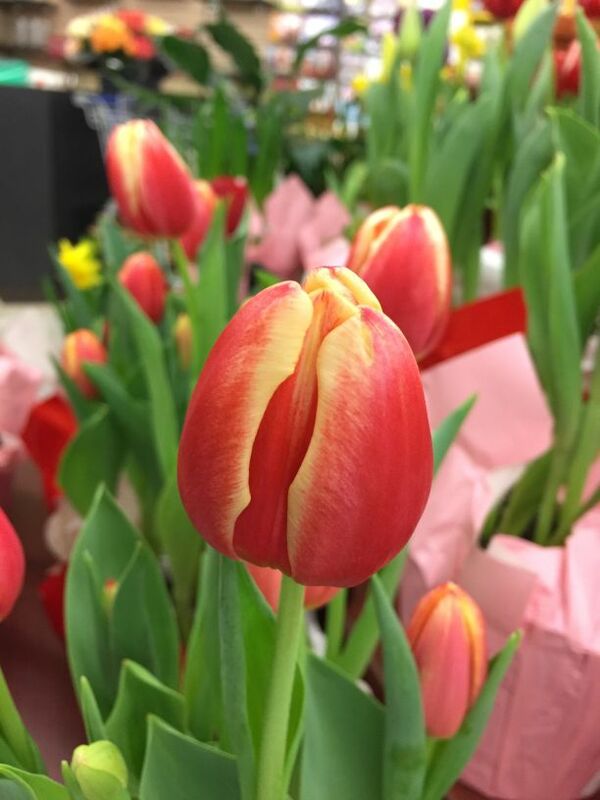 I'm unhappy with the edges and how they curled. It could be the way I knit it, though, and not a function of the pattern itself. Also, I was in such a rush to finish it and wrap it that the images of it are bad. This one is heavily edited in Photoshop to try to get the color close to correct - it's ok, but not quite right. Lessons learned - write details down, take better images, measure better, and work on the edges. I am creative; I can stretch that to say I am artistic. What I am not is a person who is able to draw. That would be a great gift, and it is a gift my older son has. He didn't get it from me. 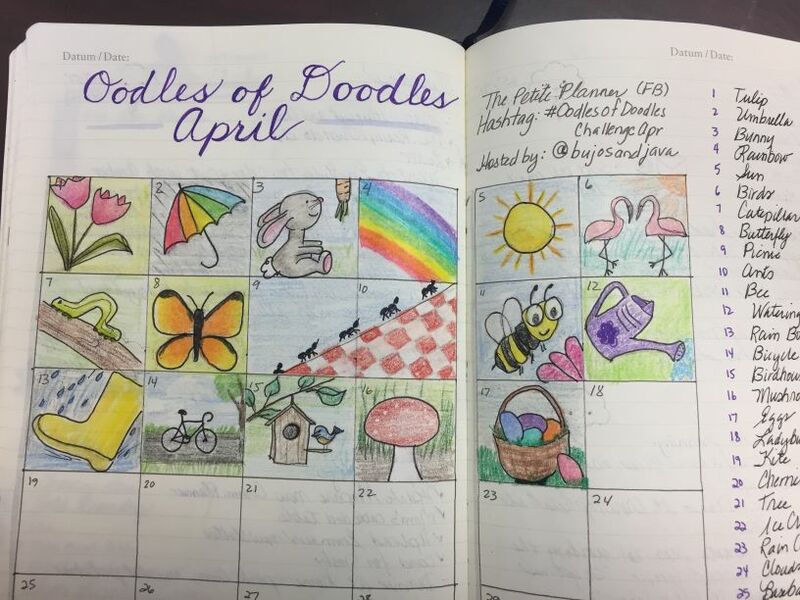 However, I was scrolling through Instagram the other day, and Stephanie Klauk posted an image of her bullet journal - the page where she was working through the Oodles of Doodles challenge for April. It's a list of prompts - 30 of them - and for each of them, you use the prompt to lead you in a doodle. 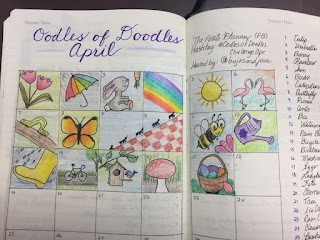 A few example prompts for April are tulip, bunny, ants, picnic - you get the idea. It looked interesting and as I said, I can't draw. But I CAN play. So I grabbed the list from The Petite Planner's Instagram feed, and created a spread in my bullet journal. The drawings are doodles. They aren't great - as I said, I can't draw. But it is fun. And it reminded me about something important regarding creativity. You don't have to be good at something to do it. Do it anyway. Play. Create. Have fun expressing yourself. 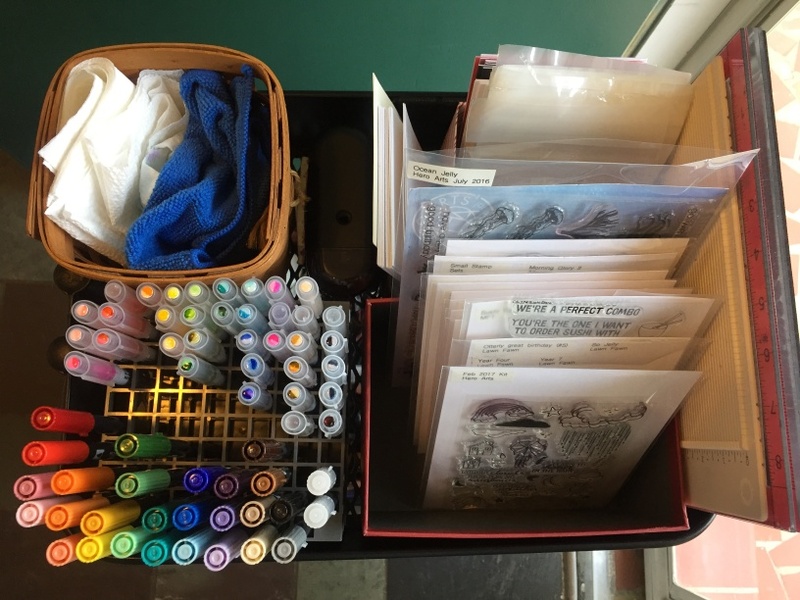 I have a cart that sits near my studio desk - it's a Raskog cart from IKEA. When I was setting it up, I looked around the internet for ideas - and didn't find many. So, this is how I set it up. Box with stamps I want to use soon. In particular seasons, this turns into seasonal stamps (like Christmas). Box with precut papers I can use for the inside of the cards, bags I use to put finished cards and envelopes together and other small papers. Basket with towels for cleaning (paper and cloth). 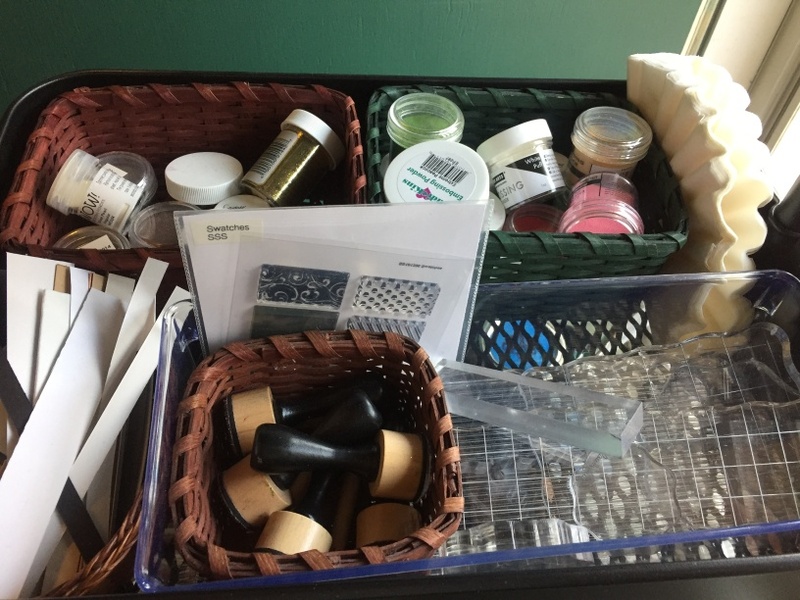 Box of acrylic box which also contains basket for ink blending tools and ink swatch stamp. I love my cart. 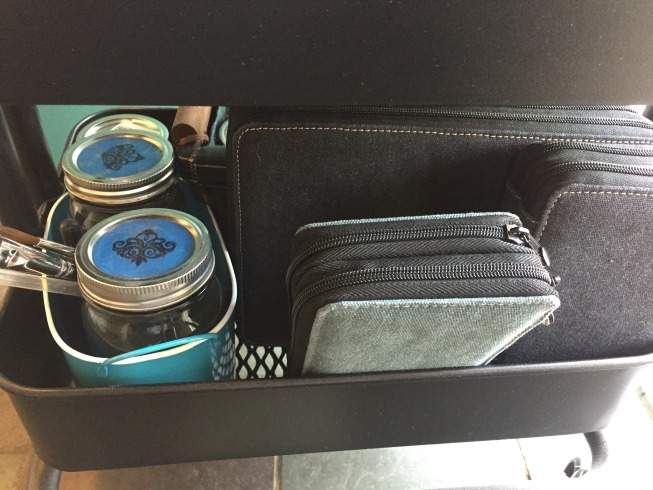 It has made staying organized, and having everything handy for when I need it so much easier. One of my favorite purchases! I also enjoy using baskets to help keep everything organized on the cart. I enjoy how they look. 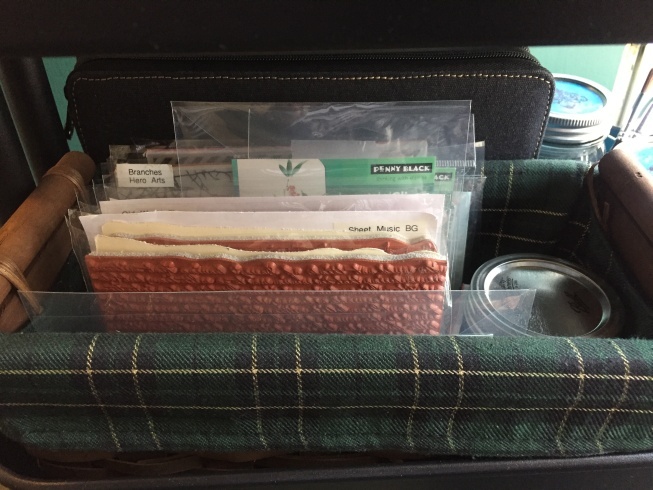 The exception to this is the acrylic blocks, which are in an acrylic storage box. 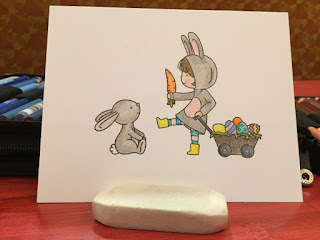 I'm working on Easter cards this week, and I feel in love with Cottontail Cuties from Neal and Tangled. I belong to an accountability group (called an Emmaus Reunion Group) - I've made cards for each of these women - 7 of them. 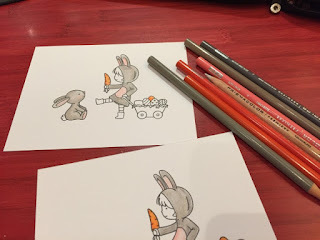 As I worked on the cards, I thought a post about these cards - step by step - might be fun to do. I stamped the images in Hero Arts Black dye ink on Neenah Solar White 80 pound card stock - I like both of these for colored pencils. I masked the little girl's hand and stamped the carrot, so that it looked like she was holding it. I wanted a soft look, so I used Prismacolor pencils (instead of copics). This design is very much inspired - if not stolen - from Laura Fadora - at this link. Watching her video inspired me to purchase the stamp set. I masked the images with post-it notes, and then used Inc. makeup brushes from Target to brush on Distress Ink (Twisted Citron and Broken China) for the grass and sky. I added a few pencil strokes in green to provide ground and blades of grass. I wish I could remember where I saw the idea of using the makeup brushes - they are a substitute for the more expensive Clarity Brushes. This is the first time I've tried them - I loved the light touch of ink they provide. I never could have gotten this soft of a background with the ink applicators I usually use with distress ink. The panel is mounted on a frame and card base from My Favorite Things. Seven of them ready for Easter! Have you ever heard of incowrimo? It is an abbreviation for International Correspondence Writing month. Since I started bullet journaling, I've been watching videos by Boho Berry. She participated in incowrimo - at the time I thought it required you to write a 28 letters in February. Cool idea - handwritten letters. I didn't want to write letters, but decided to accept that challenge and send out 28 handmade encouragement cards in February. You can tell, if you know anything about incowrimo, that I didn't actually go check out their website - until today, as I write this post. According to the website, "InCoWriMo challenges you to hand-write and mail/deliver one letter, card, note or postcard every day during the month of February." So, my card commitment was write in line with challenge - it doesn't have to be letters. At first, I thought 28 encouragement cards was a stretch goal Keep in mind that I didn't count the ones I made for Valentine's Day. As the month went on ... Wow. Not just a stretch goal - it was a big commitment. And yet, the whole process reminded me of why I send out handmade cards. The recipients were surprised - cards for no reason. A "happy" as my mother-in-law would have called it. People need that kind of encouragement, don't you think. Will I do it next year? Maybe. It was worth it. In December, I started learning about bullet journaling. I decided to give it a try. That month, I pulled a blank book I had on my shelf and a couple of pens, and started giving it a try. I liked it, so in January of this year, I started bullet journaling daily. I'll write a post about the process I use later - you can see my supplies at this link. This morning, I was planning for the day. 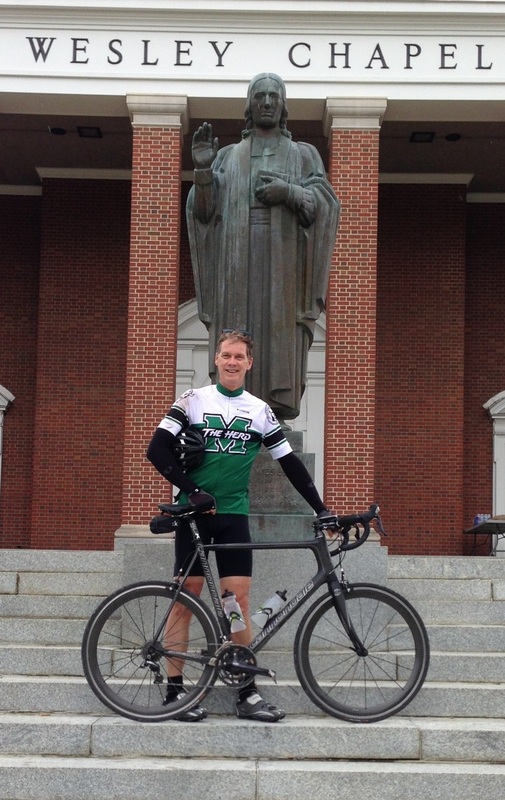 Steve had a bike ride on his schedule, and I wanted to include that in my day. 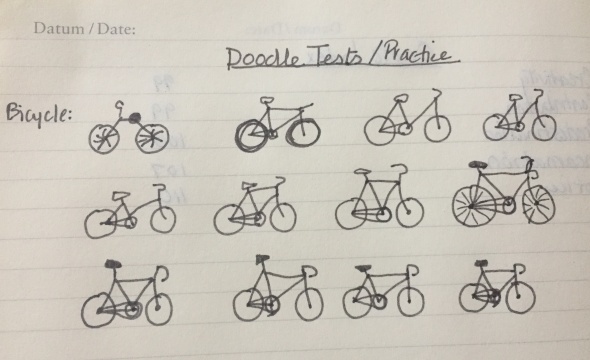 I decided to work on a doodle of a bike that I could draw on my page. 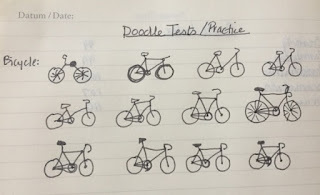 I started with a page in the back of my book, a google of bike doodles, and finally with the picture of Steve's bike that is to the right. It's still a work in progress - I like the one on the bottom row, far right side the best, but fun to play with.